Single row angular contact ball bearings feature raceways with high and low shoulders. These opposing raceways are designed to carry thrust load in one direction. 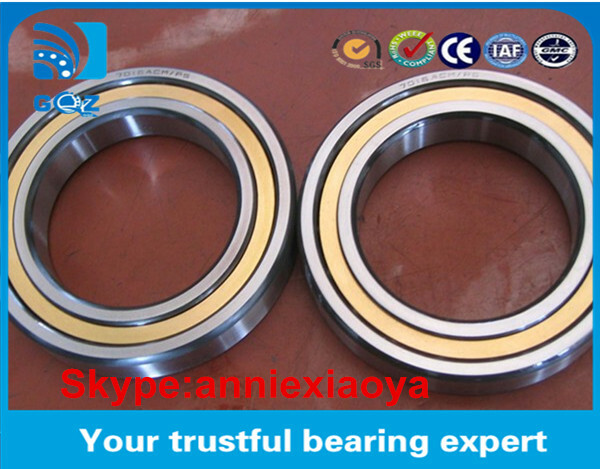 NTN can preload the bearings at the factory so that the correct load will develop once the bearing is put into service. The bearings in this series are assembled with a specific internal clearance, so that they will have a specified contact angle under load. The standard contact angle used by NTN is 30 but, in many cases, a 40 contact angle can also be specified. We also offer special high-speed bearings with phenolic resin cages with a 15 contact angle. 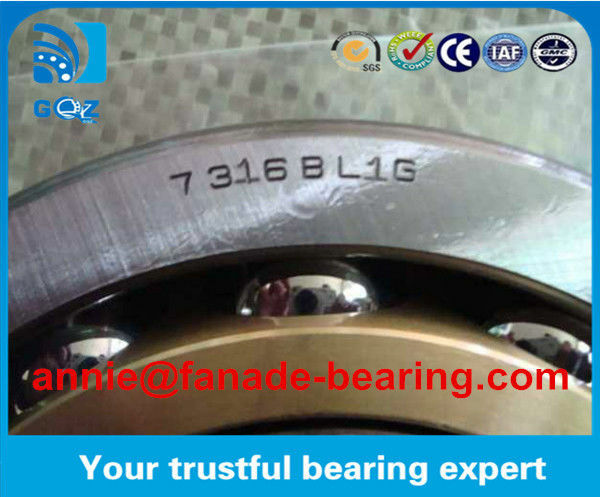 Double row angular contact ball bearings have an inner and outer ring with a double raceway. The two rows are so related that the contact angle is similar to a pair of back-to-back single row bearings. NTNs 5200 and 5300 series offer continuous races and can carry thrust loads in either direction. The 3200 and 3300 series have filling slots, so it is necessary to mount them with the thrust load acting against the un-notched face of the rings. 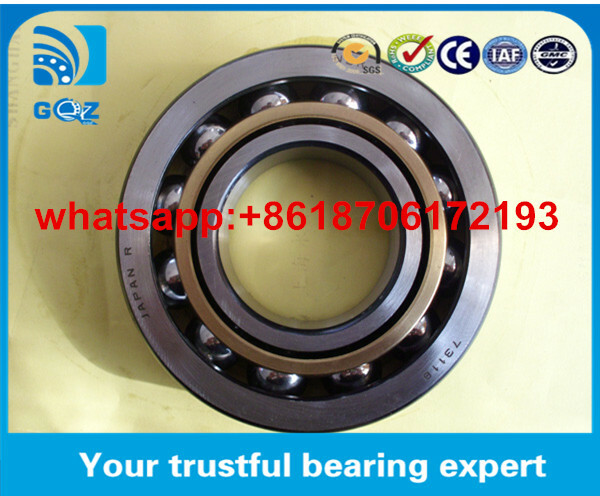 Single row angular contact ball bearings of universal design have the suffix UA, UL or UO and are intended for fitting in pairs in an X, O or tandem arrangement or fitting in groups. These bearings can be fitted in any arrangement required. For tandem arrangements, pay attention to the guidelines in the section link. The suffix UA indicates small axial internal clearance, the suffix UL indicates slight preload and the suffix UO indicates freedom from clearance in an X or O arrangement. 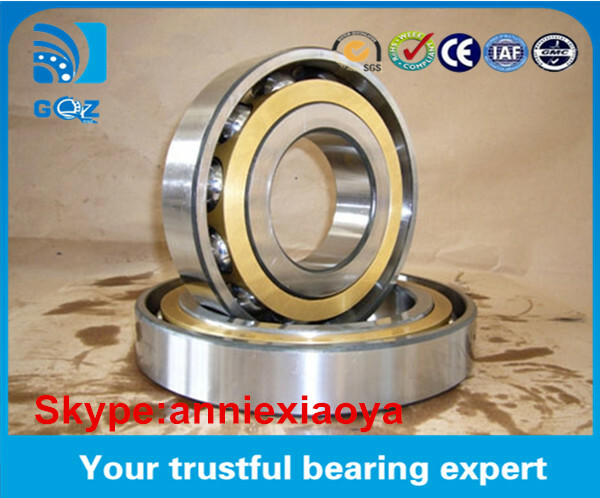 When ordering bearings, the total quantity of bearings must be stated, not the number of bearing pairs or bearing groups. Bearings with the suffix 2RS have lip seals on both sides. Contact RS seals are suitable for giving protection against dust, contamination and damp atmospheres. Bearings with lip seals on both sides are greased with a high quality grease and are lubricated for life. Open angular contact ball bearings can be used at operating temperatures from -30 °C to +150 °C. Bearings with a diameter D > 240 mm are dimensionally stable up to +200 °C. Angular contact ball bearings with cages made from glass fibre reinforced polyamide are suitable for operating temperatures up to +120 °C, restricted by the cage material. Sealed bearings are suitable for operating temperatures from -30 °C to +110 °C, restricted by the lubricant and the seal material. Angular contact ball bearings with solid cages made from glass fibre reinforced polyamide have the suffix TVP or TVH. Solid brass cages have the suffix MP. The bearings are also available with universally applicable sheet steel window cages (suffix JP). Check the chemical resistance of polyamide to synthetic greases and lubricants with EP additives. Aged oil and additives in the oil can impair the operating life of plastic cages at high temperatures. Single row: machine tool spindle, high frequency motor, gas turbine, centrifuge, differential pinion-shaft, small cars’s front wheel, etc. Double row: oil pump, roots blower, air compressor, all kinds of transmission gearbox, fuel injection pump, printing machinery, etc.